As time goes on, it seems appreciation for some of the great Motown artists is fading. 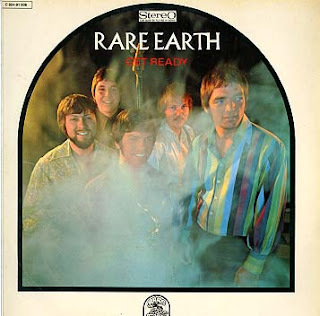 Not only did Rare Earth have a phenomenal run of hits in 1970 and 1971, but ten years later, I remember playing them at parties and getting a huge reaction. I wonder if that would happen now? Rare Earth was the first "rock" band signed by Motown, although that label is a misnomer. Just like Santana, Rare Earth combined rock with other genres, but the emphasis here was definitely on 70's funk and jazz. 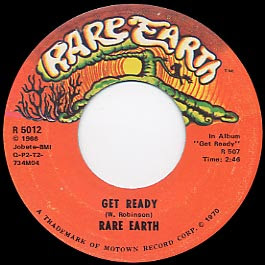 Motown even gave their label the Rare Earth name to emphasize rock acts (or white boys, who knows?). Look at that album cover and you're not thinking rock band at all. They are so clean cut behind that gauzy lens, you would think they were some pop vocal act singing Paul Anka covers. Don't judge this book by its cover. These guys totally cooked. Exhibit A is the 21 minute cover version of The Temptations' "Get Ready" that takes up side two of this first Motown album. Rumored to not have enough material, they performed what was their usual final jam from their live show. When the song was released as a single, it was drastically edited down to three minutes or so and became a true smash hit. I think it did even better than the Temptations version (which was released in 1966 and written by Smokey Robinson). On both the album and single versions, there's a lot of audience noise, screaming and whistling, but I was never quite sure if that was real. I don't believe the album mentions a live venue location, which probably means it was dubbed on. Motown was constantly recycling its own song catalog for its artists. Even if a song flopped, they'd reuse it with at least another artist to see if it would fly right this time. For example, both "I Heard It Through The Grapevine" and "Ain't Mountain High Enough" were huge hits twice for different Motown artists. Rare Earth had success with two Temptations hits -- "Get Ready" and "(I Know) I'm Losing You" -- by radically re-arranging the songs. One of the cooler things about Rare Earth is that the drummer, Pete Rivera, was also the lead singer, and you can see him doing both simultaneously in the early 70's video below. Rivera had a very deep soulful voice that was immediately commanding and irreplaceable when he left the band in 1975. Below are three videos of "Get Ready." The first is the 45 being played on a turntable, so you can here how this epic jam session was cut down to three minutes of party time soul/rock. The second is Rare Earth performing the song live in 1973, now with an additional Latino percussionist, firing up a storm as electric as any early Santana show. I'm knocked out by Rivera, who is totally zoned in to his drumming with his eyes closed, singing at the same time, completely getting into the sweaty groove. Boy, I would have loved to have seen these guys in concert back then. You have to love the days when popular rock acts would perform with their shirts off, like the keyboardist does here (and seems to in just about every Rare Earth video I've found), while Rivera is all muscle shirt. And I'm just digging that whole crowd dancing to the song. The third is a knockout black and white clip of The Temptations performing "Get Ready" in 1966. Check out the Temps' dance moves, Eddie Kendricks singing lead, and the girls going crazy in the upper part of the stage. As far as I'm concerned, these last two videos are mandatory viewing. I agree with you . Rare Earth was a phenomenal band. I was just a kid when their Mowtown album came out but the teenagers at our family reunions played that album over and over again. I particularily loved their version of " I'm Losing You". That is the best version yet. I hate that your videos were erased. i would haveloved to see them.